I accidentally posted this review under the blog section, and thought I better correct it. I was looking for a clamp that could hold a glue up of two 45 deg strips of wood to make a block. Basically two triangles glued together to make a square. All the woodworking site searches produced nothing. Then I came across these clamps on a welding website. I ordered three of them from my local welding supply store to see how they would work. The man at the supply store had never seen them, apparently they have a patent pending. Took them home and tried them out. The clamping pads swivel from about an 80 deg angle to more than 180 deg angle. Also the pad heads are locked inline with the clamp, but can be unlocked to swivel 360 deg. 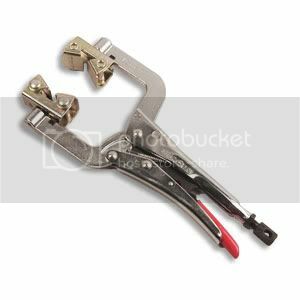 The clamping mechanism is on the same principle as a vise grip, having a threaded adjustment for closing or expanding the jaws, and a quick release lever. 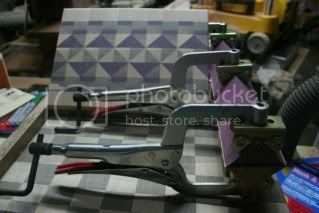 When I clamped up my triangle strips the swivel head pads centered the two triangles together and put the clamping pressure directly over the angled center glue up. After clamping together maple & purpleheart, walnut & purpleheart, and maple and walnut, I planed them down to size being careful to keep the 45 to the corners. 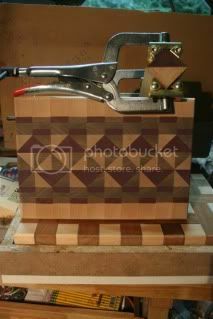 Then glued up the strips like I do for an endgrain cutting board, cut to thickness, and flipped and rolled until I was happy with the pattern, glued again. The board in the pictures was my attempt, I think it was successful. The website I have posted has some great clamps that can be used for all types of applications, I am going to put rubber pads on the clamping surfaces to protect the wood, but other than that, these clamps are an awesome solution. Ah, that’s what you use them for. Neat. hey dustbunny you are right they are quality tools. I had a job fabricating ornamental metal handrails for federal building restorations and we used bessey f clamps exclusivly. When they started getting worn out they replaced them with the stronghands and wow what a difference. Tough tools. quite inventive head for those clamps – impressive. that board looks fantastic Lisa!